This Witness was for two-score years a slave to the tobacco habit. For thirty years he was destroying his body with alcohol. For many years he not only defiled himself with swine’s flesh, but was guilty of selling it to his neighbors. 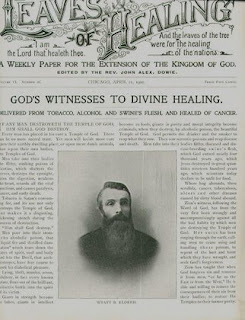 He was attacked by cancer, that deadly disease which so often comes with its almost unendurable torture to complete the destruction of the body begun with tobacco and swine’s flesh. The lower part of his face was literally rotting away…. Dear General Overseer: At the earnest request of J. W. Briggs I went to see Elder Stevens on July 26, 1899, when he was here holding meetings. I was a sinner sixty-five years old, having never made a profession of faith in Christ. About four years ago, a livid blue mark appeared on the point of my chin. It rapidly developed into an offensive cancer. After talking with Elder Stevens, I repented of my sin and gave my heart to Christ. I had used tobacco forty years and liquors thirty years. When Elder Stevens laid hands upon me and prayed, I was immediately healed of the desire and appetite for both those poisons. I have had no desire for them since. The cancer began to dry up. I continued selling pork in my market, and the cancer began to grow again. Elder Stevens told me I would not receive complete healing until I stopped handling pork. I finally gave up the market and am perfectly healed; no trace of the cancer can be seen. I am going back to the farm, gloriously happy in Jesus and Zion, thanking God for it all. This is the order from the Creator of the Universe and Supreme Law-Maker. All Muslims are under obligation to obey it. This is a plain and straightforward answer to those, who usually ask why Muslims abstain from eating pork. Nevertheless, there is no sin, if a Muslim is forced by famine or starvation to eat pork in order to save his life. Jews also are strictly prohibited from eating pork (Torah. In the book of Leviticus, Chapter 11, verses 7 & 8 it is recorded that God declares the pig to be unclean for believers. "You must not eat their meat nor touch their carcasses; they are unclean for you." The Bible has also forbidden swine-flesh, but Christians disregarded this order and started consuming it. Modern science has revealed many scientific reasons for not eating pigs. Pigs have no neck which makes it impossible to be slaughtered the Islamic way by the insertion of a knife in the neck and thus getting rid of the blood which contains an abundance of uric acid, a toxic chemical substance which can be injurious to human health. The pig excretes only 2% of its total uric acid content, the remaining 98% remains an integral part of the body. Pigs are perfect vessels for transporting diseases to humans. Influenza (flu) is one of the illnesses which pigs share with humans. This illness is harbored in the lungs of pigs during summer and tends to effect pigs and humans in the cooler months. Pork sausage contains bits of pig's lungs, so those who eat pork sausage tend to suffer more during the epidemics of influenza. Eating pork can lead to different kinds of infections such as Trichinosis which causes diarrhea and other gastrointestinal symptoms as the worms multiply in the digestive tract. When the larvae circulate through the bloodstream, the patient experiences edema, irregular fever, profuse sweating, muscle soreness and pain. There is no specific treatment. Those who consume pork are more prone to obesity because of the high fat content in pork. In this group, blood cholesterol level is frequently higher than normal; pork-eaters are more susceptible to arteriosclerosis, which may result in cardiovascular diseases, malfunction of the brain blood-circulation , vascular pathology of the lower limbs, etc. The pig is the main carrier of the taenia solium worm which is found in the flesh. These tapeworms are found in human intestines with greater frequency among eaters if pig. This tapeworm can pass through the intestines and affect many other organs, and is incurable once it reaches beyond a certain stage. Researchers at the University of Ottawa have linked pork consumption with "cirrhosis", a chronic degeneration of the liver. In a study of 16 nations with readily available statistics for consumption of pork, beef, alcohol and fat, Dr Amin Nanji and Dr Samuel French found a correlation between eating pork and the incidents of cirrhosis of the liver - an even higher incidence when pork and alcohol were consumed. Pigs wallow in mud or water to cool their body as they are the only animals that don't have sweat glands. They live and thrive on muck, faeces and dirt. They eat almost everything and anything; garbage, carcasses, human and pig excreta. The list of microbes and parasites found in pork is vast. Many of these diseases as yet remain incurable. They can cause appendicitis, dyspepsia, Tuberculosis small pox, bacterial diseases, viral infections, Erysipelas or St. Anthony's fire, Japanese encephalitis (B-type), Salmonella Cholera Suis (cholera), Protozoan infections,...etc. Besides, lard contains 2800 units of vitamin D per 100 grams and no vitamin A at all. Lately vitamin D has been held responsible for atheroma, by causing increased absorption of calcium in the blood vessels. Animal fats contain saturated fatty acids which have been found to be one of the causes of atheroma in man. Medium bacon fat contains 25% proteins and 55% fat. Dr. Glen Shepherd wrote the following dangers of eating pork in the Washington Post. "One in six people in USA and Canada have germs in their muscles - trichinosis 8 from eating pork infected with trichina worms. Many people so infected have no symptoms. Most of those, who do have, recover slowly. Some die and some are reduced to permanent invalids. All were careless pork eaters. Schitosoma Japonica. This disease is manifested in hemorrhages and anemia. In the case of the ova infesting the brain or bone marrow, the disease may bring about paralysis or death. Paragonimus Westermani. Infestation may result in haemoptysis, or the coughing up of blood, due to worm setting in the lungs. Paciolepsis Buski. This parasite causes dyspepsia, severe diarrhea and general edema. Both the Bible and the Qur’an prohibit the eating of pork. Muslims are aware of this prohibition and observe it strictly. However, most readers of the Bible say they do not know where they can find this in the Bible. In the book of Leviticus, chapter 11, v. 7, it is recorded that God declares the pig to be unclean for believers. Then, in verse 8, God says: “You must not eat their meat or touch their carcasses; they are unclean for you”. This command is repeated in Deuteronomy 14:7-8. Then, in Isaiah 65:2-4, and 66:17, God issues a stern warning against those who eat pork. Some people are aware of this prohibition from God, but they say that they can eat pork because St. Paul said that all food is clean in his letter to the Romans 14:20. St. Paul said this because he believed (as he wrote in his letter to the Ephesians 2:14-15) that Jesus had abolished the Law with all its commandments and regulations. He seems, however, to have misunderstood what he heard about Jesus. In the Gospel According to Matthew 5:17-20, Jesus is reported to have said quite the contrary, as follows: “Do not think that I have come to abolish the Law . . . ." Jesus then went on in that passage (in verse 19) to denounce anyone who would break the smallest commandment and teach others likewise. He also praised his true followers who will practice and teach even the smallest commandment. One of the commandments, as we have seen, is to stay away from pork. [b][url=http://www.uggsunitedkingdom.co.uk/]ugg boots uk[/url][/b] Â¢ Beware of imposters. Another person might send you an e mail pretending for being related having a company or charity. Others might develop an internet site that looks similar to that of a well-known company or charitable group. The welfare technique which was presented to us really is excellent. But I feel that it's flawed. I recall a song I seen in a very club throughout my very first yr at University "when pupil financial loan drops, get out the bar." And trust me, they seriously do that! I really like London, and all the things this town has to offer me, but let's reevaluate some details! In my view, the English education method won't instruct us how you can expand up earning and with regard to the critical importance in the worth of money. [b][url=http://www.cheapuggbootsonlinesales.co.uk/]cheap ugg boots[/url][/b] One more important company if allotment LED lamps for your personal experience is whether or not they are water-proof. When they are not waterproof you larger achievement you by no means get bent from the rain because they will abbreviate out and become junk. The LED strips turn into water-resistant due to silicone that encases the absolute strip, which aswell in about-face causes it to be shockproof..
[b][url=http://www.seekingbestbags.co.uk/]louis vuitton outlet[/url][/b] A lot of people are searching for the right pet. No matter if you're single, freshly married, married with several little ones, or about to retire, you can find some points to take into consideration after you commence seeking to involve a pet into all your family members. Any time you think of possessing a pet, you probably believe you need to choose between possessing a pet or simply a cat, but actually there are actually numerous animals which will become ideal pets..
[b][url=http://www.uggsoutletsite.co.uk/]ugg boots outlet[/url][/b] One particular great thing about this spot is the fact it is not significantly from towns like Washington DC, or possibly Ny. Inside the previous I'd have this stress with regards to the way I dress, but what I've observed is that you have to require into context in which you are at during the metropolis and who it is you might be observing. Such as after i was in Manhattan there have been an abundance of doing the job females who looked at those people they have been ripped from the pages of Vogue, but in other places in the borough, such as in Harlem, superior trend didn't appear to be to get just as much of the priority. [b][url=http://www.seekingbestbags.co.uk/]louis vuitton purses[/url][/b] 4. The headline is most likely an important factor. In the event the title of the article ended up Frees, there an excellent possibility you wouldn have found the prospect of looking at it extremely attractive. All over again, it is just polite to carry out so. Do not provide them beers, they are really not allowed to consume to the career, or carry it with them although about the position. As an alternative of tipping, it could be recommended which you can address them to the pizza, or simply a couple of burgers, and several chilly beverages (if you will find much extra than a couple of movers). Hello. Facebook takes a [url=http://www.onlineroulette.gd]free casino games[/url] lash on 888 casino administer: Facebook is expanding its efforts to put forward real-money gaming to millions of British users after announcing a apportion with the online gambling found search for 888 Holdings.And Bye.